Welcome back and Happy New Year, everyone! I’ve got some news which I’ll discuss below. 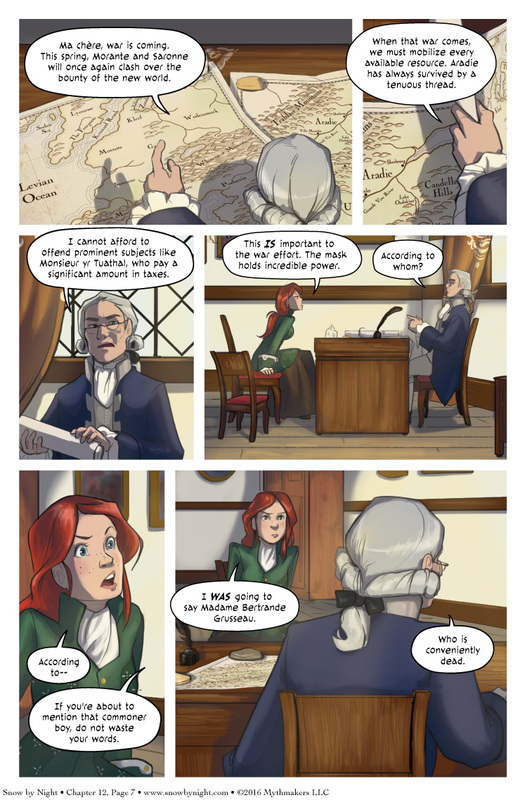 But first, Vivienne’s Father lays out why he says no on Chapter 12, Page 7. Turns out, he just doesn’t believe in the powerful knick-knack to paddy-whack the Morantine throne. Hey, that scans! To see a preview of page 8, please vote for Snow by Night on Top Web Comics. So the news, 2016 will be a big year for Snow by Night. I’m finishing off the last rewards from the Vol 2 Kickstarter. Once that’s done, I’m going to run a Kickstarter for Volume 1 and Volume 3. I’ve been wanting to move Vol1 from the individual chapters to volumes for a while now, and we’re almost done with Vol3. I’m also contemplating making a Patreon page for Snow by Night to show some of the design work that Julie and the artists do as well as other benefits. I’ll keep you all informed. The big news. In Volume 3 I will be joined by a new colorist. Naty has been with me for 9 chapters, but the demands of school and other commitments means she has to curtail her activities here. I greatly appreciate all that she’s done for the comic. Naty, thank you very much. Starting with Chapter 13, Steph Stober will be taking over coloring for Snow by Night. She’s the one who helped me resdesign the Snow by Night web page and is the artist for Final Arcanum. She has some big shoes to fill with Naty’s departure, but I have great faith in her. Welcome aboard, Steph! Also according to any tribesman you show it to and that’s without even having to put it on. Final Arcanum was wonderful. Your story will be in good hands. A fond farewell to Naty, and a hearty hello to Steph! Naty has been really good to me. She makes everything she touches better. I’m going to miss her. Steph is super good too. I’m looking forward to working with her. And yesss, SBN’s back! Happy new year everybody! Wooooooo! And it’s going to be a fun year too. So much planned. I managed to work a mini-game into this chapter. Mwah ha ha. And seriously why is she or anyone else trying to use the power of the mask. She doesn’t know how it works, only that it is connected to a spirit which, if given the chance, will burn the world to cinders. How does she intend to contain the manitou between its prison and wherever she intends to extract its aether (or, for that matter, while they are extracting its aether)? It better be perfect, or they’re all going to die in a fire far worse than the one that killed their alchemist. Very good points. Let’s hope that Vivienne and Jassart are up for the challenge they set themselves. Ah, tant pis. In our culture, what we don’t commandeer, we steal. And I happen to keep a pet thief for just such occasions. Is this the same Steph that has appeared in Today Nothing Happened? Yes. She and Shazzbaa are good friends.